Livonia is a traditional suburbia city connected to the metropolis by freeways. So take the wheel and pull into the Livonia show. Spend the weekend with the other estimated 1200 registered buyers. 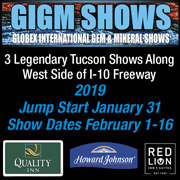 We’ve got it all at this show: precious and semi-precious gemstones and beads, fine jewelry, gold and silver, rough and cut minerals, etc.